I finished this Vogue 1099 (oop): Badgley Mischka jacket well over a month ago. But, didn’t have a hook and eye closure and didn’t know what to wear it with! The jacket, I think, can be a bit hard to wear. I tried a bias skirt in orange it just looked to ‘big’. My wide leg black pants made me look like a block since I don’t have thin, six foot long, model legs. So, this poor beautiful jacket has been languishing on my dressform for weeks. 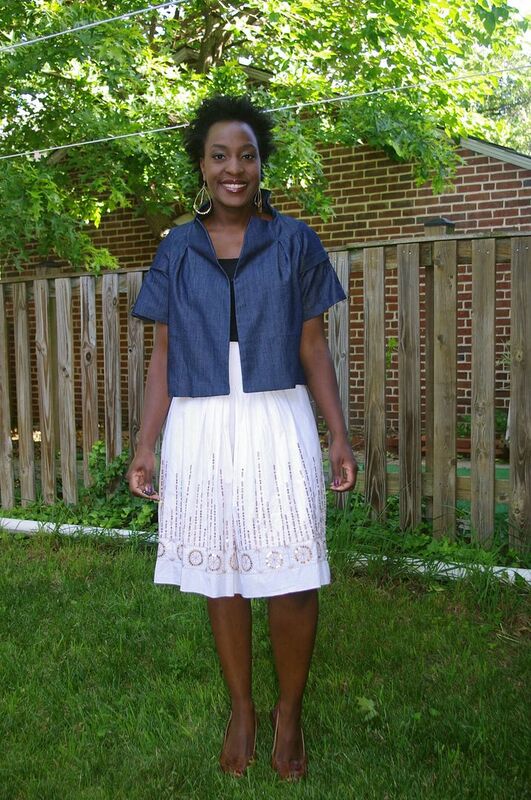 I finally figured out this Burda 9-2009 skirt I made last summer to wear and wore it to work on Tuesday. It was incredibly popular. My hyper critically fashionable boss complimented me on it. Twice. She’s way into modern detail on clothes. Plus, she was probably telling me to wear more blazers! I first talked about making this Badgley Mischka jacket in May, THREE YEARS AGO. This is why I am working out of my stash folks. Three years go by before I can even contemplate getting something sewn that I have all the supplies for. I was able to try this jacket on during PR Weekend Portland 2009. It’s a little odd making a garment you’ve already tried on and seen made expertly. The good thing is that you know you’ll like how it looks on you. It’s a jacket I never would have though of if I hadn’t tried it on. The bad thing is you’ve got something to live up to! I’m not sure what size the on above is. The material (despite the bright blue below) is the exact same bamboo denim. I bought what was left in the store! When I tried on the jacket, I could see (and remembered) that there wasn’t enough room in the bust despite the ease of the jacket. For my version, I sewed a 12 with a 1 inch FBA. I find it a little constricting in the back. But, then again, I don’t often wear woven jackets. I think I should have sewn a 10, my version is little more full. But, I don’t think it looks bad. The lining is a floral cotton that I also got that weekend (because I had this jacket in mind) — or in California for PR Weekend LA. I honestly am no longer sure….. 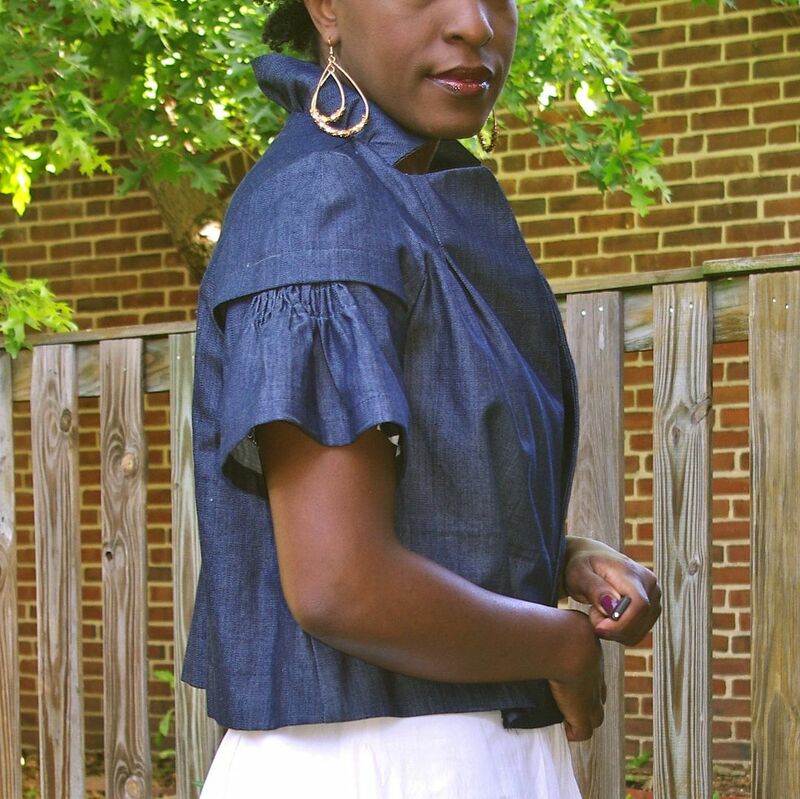 The pattern does call for a double collar — with organza for the inner collar. But, I didn’t have any and thought it looked just fine without. 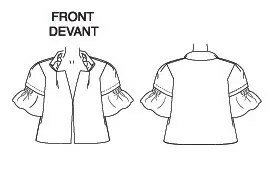 I don’t know how to explain this, but I do not love the sleeve insertion — especially the lining. For the shell, there is little easing needed, but I found the sleeve head kind of flat and just ‘meh’ for my taste. For the lining. I don’t know what was going on. But, it took me a lot of pinning and thinking to make all the pieces work out. I know that’s not helpful. But, I was working on it at 11 pm on a Friday night and didn’t think to take photos. I followed the directions to the letter including hand sewing the the lining to my blindhem stitched hem. Good grief. I can’t remember the last time I handsewed a hem! I would love to make this up again in seersucker (are you shocked by that), white linen or a beautiful black silk shantung. It’s a quick sew. I had the entire shell cut constructed and sewn in four hours. That includes the super annoying gathering on the sleeves. 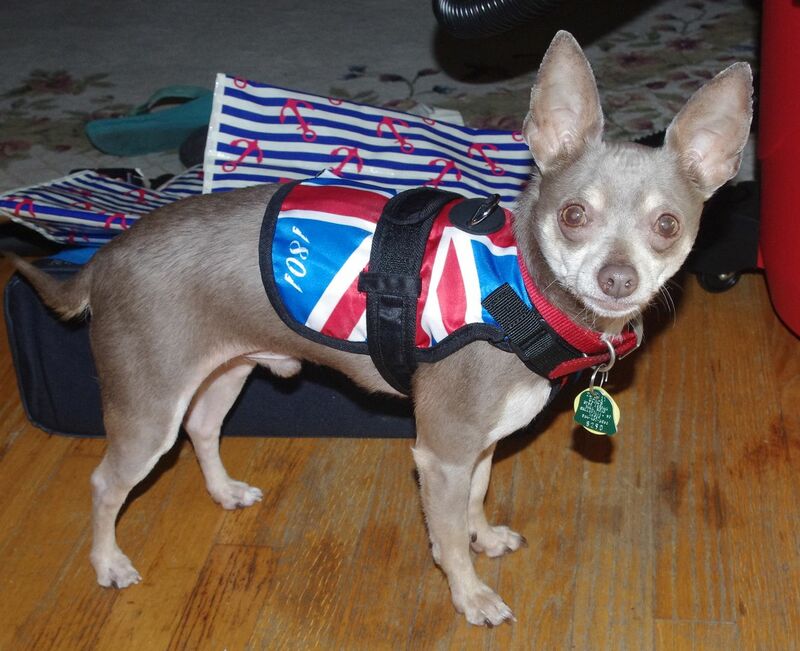 My friend Liz got this Union Jack harness for Linus. He’s so stinking cute it’s criminal. I love the graphic nature of the Union Jack and have a ridiculous pinterest board dedicated to its use in every day objects. Once again, it looks fantastic, I have to admit, I’d hate those sleeves too. But the jacket isn’t really my style,which might be part of my issue. However, it looks great on you. And the skirt fabric just makes me itchy all over to sew. Great job! Cute jacket! Looks nice paired with the skirt too! Looks great! 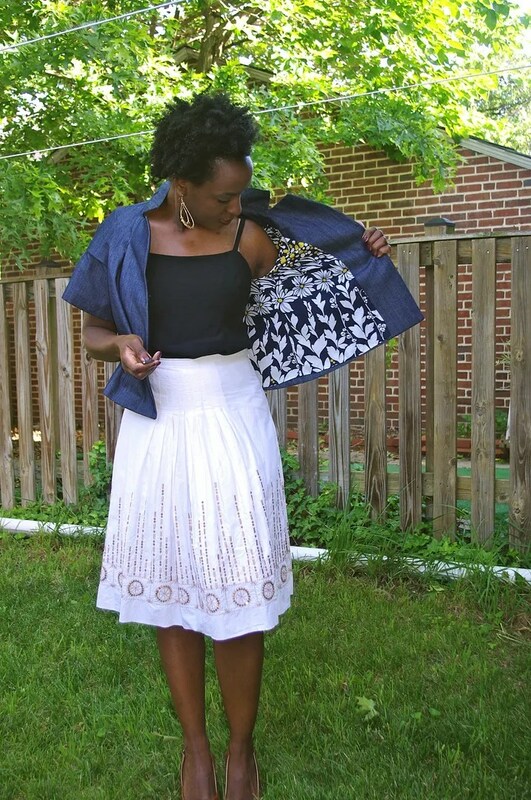 I love the lining and I think it looks great with the skirt. Linus is very, very sweet. I want to kiss his little tiny nose! I like the jacket on you and I love the lining. I can see it over a turtleneck and jeans, too. I love the jacket! But please correct the title: this is a badgley Mischka design, not Issey Miyake. LOL, why in the world did I write that? Thank you! Good Grief! What is wrong with me? LOL! Thank you! Lovely colour, and looks really nice with your white skirt. I made this jacket about a year ago and have worn it only a handful of times, even though I love it. I enjoyed the construction process, but think you’ve licked it with that lining! Great jacket for you and the puppy! Great jacket and lovely skirt. The dog looks great too! I can’t get enough of denim. Demin with a ladylike twist is my favorite. Looks smashing on you. Me either! 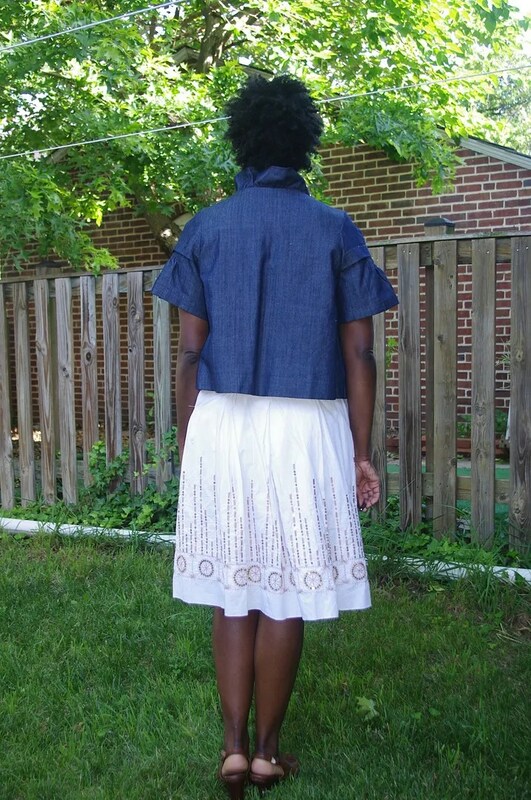 I’m going to have to make a denim skirt next. I made Vogue 1247 in denim – its my weekend uniform! Do you mind if I ask what you wear it with? I was worried denim on denim might be too much. Yes I don’t do ‘double denim’ but I wear a striped top, usually my brown boots (winter here) and often a little black bomber style jacket. The jacket looks great. I would never have thought to make this pattern in denim. It turned out great! You remind me that I have wanted to make this one up…Linus is just too cute!! Love this jacket in denim! It looks so fresh with the white skirt! Wonderful jacket in a terrific fabric. I know what you mean about that sleeve insertion….a little anticlimactic after their unique design technique. I don’t wear mine too often since it’s a short but full top silhouette. Love how you paired it! I really like that jacket. mmmm yep I am liking that… and Linus I agree is so stinking cute its criminal ROFL :O) he is just total cuteness! Great jacket and I love your picture of Linus…very cute. That is such an attractive jacket. And you are so fortunate to have that fabric. Not available in the US since the FTC stepped in. Is it like Tencel? 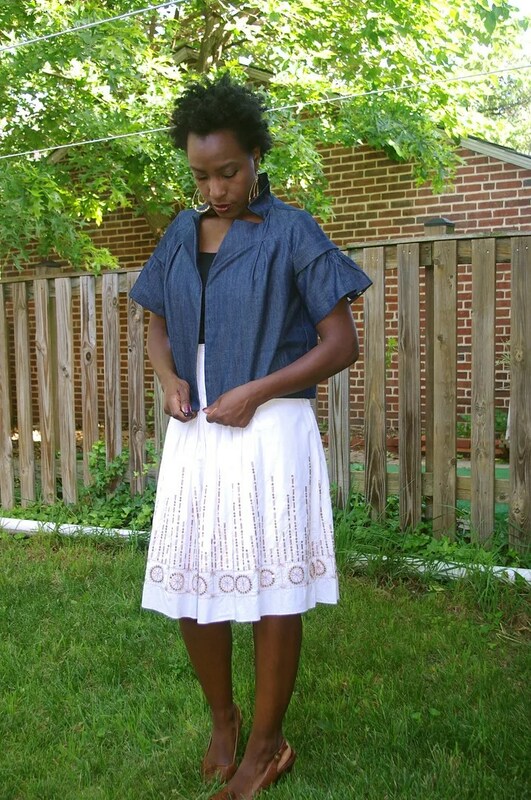 Lovely jacket – I love the side view of the sleeves. And that dog jacket is too cute! Great jacket! I think the sleeves and lining give it that extra zip. It looks very nice on you!!! Really cute. The sleeve details is excellent. 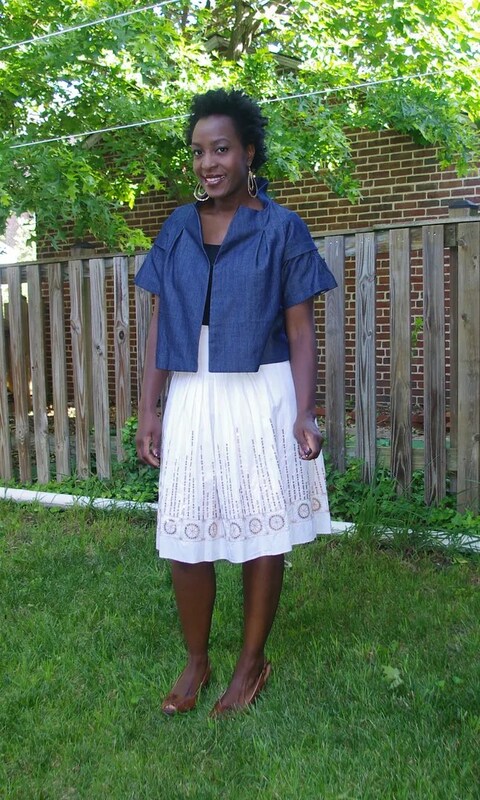 It’s perfect with the white skirt–no wonder SRB was complimentary! The sleeves are very cool, though gathering denim sounds quite painful. I think the jacket is cute, no doubt about it, but I can see why you’ve found it difficult to find things to wear with it. Most of what you own accentuates your small waist and this doesn’t. I agree with another poster that it would probably be very flattering with a maxi skirt or very slim pants. 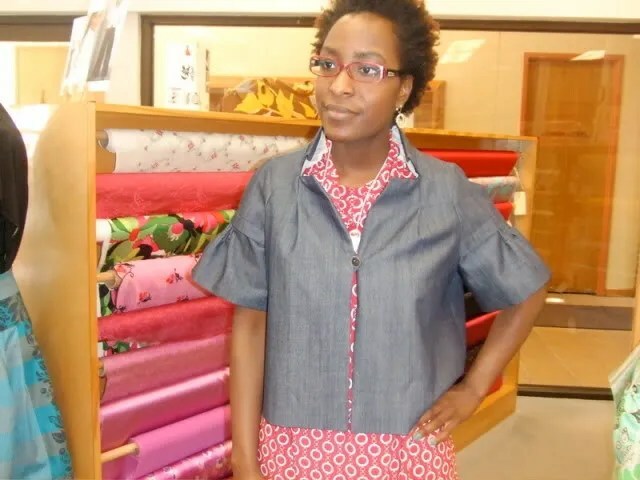 Hi Renee–cute jacket, you have some amazing skills! Hi, we’re Think Energy, a power service provider that serves the Baltimore area. We’re looking for input from bloggers like you for the current contest we’re running: the search for the smartest small business in Baltimore. Whether it’s a standout restaurant, a shop with a creative concept, or a service you can’t live without, we want to hear about it. The winner of this contest will receive a year of FREE electricity from Think Energy, and you can be eligible to win an iPad 2 just for nominating. We’re passionate about small businesses in Baltimore because they’re integral to what makes this city so special. You can nominate your favorite company at http://www.smartestbaltimore.com. Thanks and keeping up your awesome blogging! Renee – I’m so glad to see this made up. If you were to have your dream of dreams, how would you change this jacket, no matter how impractical or how impossible it may seem to make it your dream jacket. I think this jacket has so many neat features, but just misses, and haven’t made it up yet, for that reason. Great question! It needs more shaping through the waist to work for me. Or, I would make it longer and belt it. I love the sleeves and I love the collar. That being said, it was popular in the office so maybe it just doesn’t photograph well. It’s also not my traditional style. But, I do think it’s a keeper. I also think if I was smaller on the bottom and comfortable in skinny pants, etc. this would in general work better. I did a muslin of this after it came out and left it at that. It’s a difficult jacket for a curvy woman to wear. How about a pencil skirt with this? Or even narrow straight leg pants, just not the skinny pants. It has some really niece details which work well for you. and it looks fresh with the white skirt. This is sooooo nice! I’m looking out my window onto a dreary English road on a dreary, rainy, dull dull dull day and it’s a pleasure to look at something so fresh and spring-like in my inbox! I love your jacket! So cute. I’m sure I have this pattern is my stash…somewhere. Don’t ask me where. 🙂 But I think I need to find it after seeing your version.